Last week we asked you what top 3 features in iOS 12 were you looking forward to. 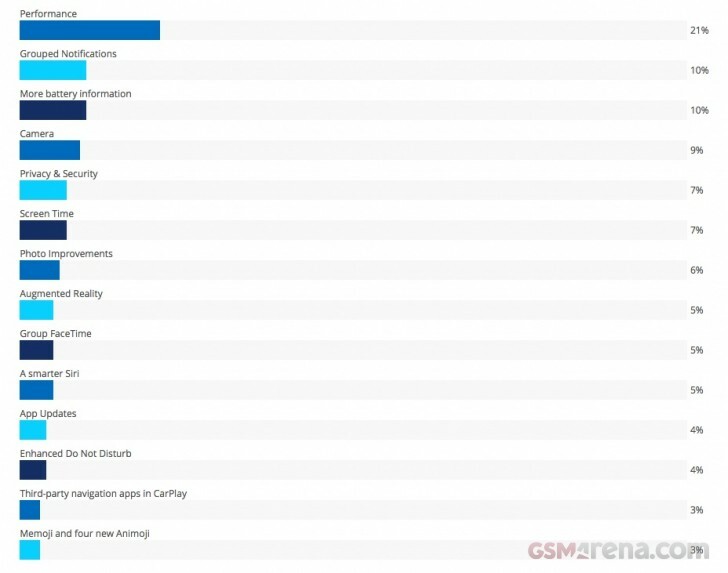 Unsurprisingly, Performance garnered twice as many votes as any other iOS 12 feature with 21% of you hoping for increased responsiveness from your iOS devices. It looks like early feedback is proving that Apple has indeed delivered. The first betas of iOS 12 clearly show improved performance, even with the expected inefficiencies that betas often contain. While Apple would never openly admit it, we're also hoping some bugs have been squashed behind the scenes too. For many of us, this makes iOS 12 a must install. It was a closely fought battle for second place with a tie between Grouped Notifications & Battery Information with 10% of your votes - we hear you Android users, but better late than never for us iOS peeps. For many, the camera in their smartphone is the best camera they need, and as such, we'll take any improvements. Hence why a combined 15% of the votes were for Camera & Photo enhancements. We've still got a ways to go with many many more beta releases of iOS 12, and we look forward to seeing what other undiscovered features we can find. Weekly poll: What iOS 12 features are you most excited about?